Plea minutissima is a small back-swimming bug that occurs in a wide range of aquatic habitats including ponds, lakes and slow moving rivers. It is often associated with fine leaved water plants like Water Milfoil and Water Crowfoot. Eggs are laid into the leaves of these plants in June and July and take about 4 weeks to develop into nymphs. Nymphs develop into adults after a further 7 weeks and by September the development of the new generation is complete. Adults overwinter. P. minutissima feeds mainly on small crustaceans, especially Cladocera (which includes Daphnia spp). 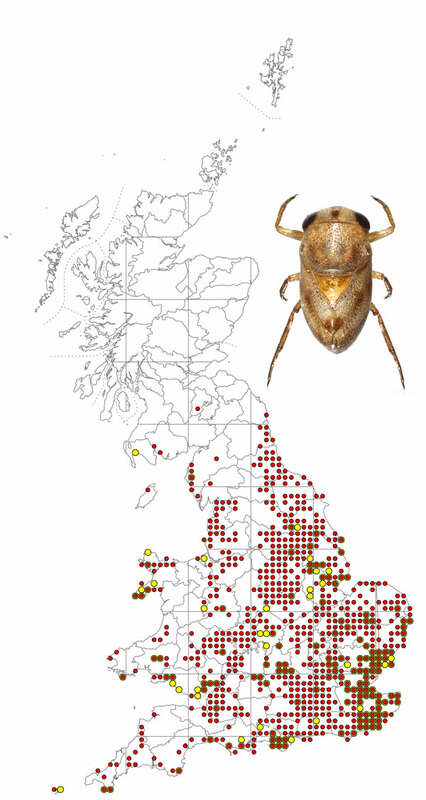 P. minutissima occurs throughout England and Wales and extends into southern Scotland. The map is based on records from NBN Gateway, with yellow dots showing pre 1990 records, reds dots 1990 – 2015 records and red on yellow dots overlapping records. P. minutissima is the only member of the Pleidae in Britain. It is a small (2.1 – 2.7 mm) deep bodied bug that swims on its back (like the much larger Notonectidae). The entire body is strongly punctured and brownish-yellow in colour with darker markings.